You may be surprised to learn that the slate bed of the average pool table is probably around a million years old and composed most likely of hot volcanic ash compacted over time into the slate which is the ideal material for making pool tables. In Italy, a country which has never been short of volcanic action, Italian mines supply around a third of all the slate used in pool tables around the world. Not all types of slate of the same. The particular kind of slate found in Italy is very low in quartz content making it both very strong but also very elastic and this of course makes it less prone to shattering during the mining process which frequently is carried out using explosives. 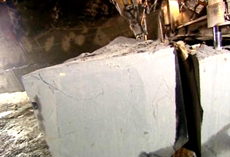 Once the chunks of rock have been hauled out of the mine using bulldozers, they are taken to a nearby masonry factory for processing. 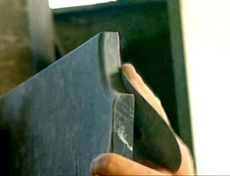 In the factory, the rock has first to be sliced into manageable slabs and to this purpose a giant saw is used which acts something like an enormous egg slicer, cutting the rock into thick sheets. This process must be carried out relatively slowly otherwise the rock would crack. 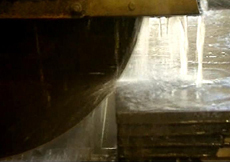 Also a lot of water has to be used because of the amount of heat generated in the blades of the saw. 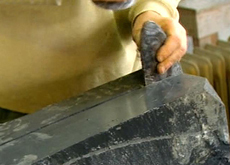 Because slate is made up of a series of layers, every cut made, and these are generally made by hand, has to be made along the convenient line of cleavage. However, unlike wood which has a tendency to warp along its grain, the rigid structure of the slate which has been formed over huge lengths of time means baize as long as it is cut in the right direction, it will almost certainly produced relatively thin slabs of uniform thickness. When the slicing process is complete, the slate is then cut to more or less the exact dimensions of the pool table required. Next, the holes for the pockets in the sides and corners of the table are cut out by another machine following which a bevel is added by a robot arm which also smooths off all the edges even further. But there is no substitute for the human eye and even after this process, a human will check and further smooth the pockets by hand. (Right) This completes the first stage involved in making a pool table.